9am - Yesterday was a learning experience for me! It never dawned on me that watering my Impatien flowers on the balcony could destroy the concrete floor out there. After Robby, the apartment owner, told me of a long time tenant destroying his balcony's concrete floor, I got busy changing where I water my flowers! After the waterfall developed a leak, the area under the fall was always wet. Bad wet! Yesterday when I went shopping at Dixieline Hardware, I bought a can of "Rust-Oleum Flexible Rubber Coating". This Rust-Oleum product is designed to seal leaks such as the waterfall's. Watering and potting flowers put lots of water on the concrete floor. However, by simply doing my watering and potting in an inside sink, not one drop of water will fall on the balcony in the future. I'm using a fan to assist in drying the concrete floor. The temperature is going to 90℉ this afternoon. The heat should help the drying a lot. Do you know why I stopped RVing? Of course there's MsTioga's demise. But I could have gotten another RV. No. The reason I stopped RVing was and is, I was not physically able to do it anymore. If that is true, and it is, then why did I spend about an hour online this afternoon, browsing camping trailers? Your balcony doesn't have a drain hole!? How does the water blown in during a rain storm drain? Every balcony in your apartment building has the same potential problem. Looks like questionable engineering or construction to me. Yes. The balcony concrete slopes to a drain. However, the tiny amount of water that comes from my garden only puts water drops on the concrete. Not enough water to even call it a small flow. I am guessing that it is the constant dampness that harms the concrete. Now that I am bringing zero water to the balcony, the dampness will dry completely. And only return when the wind blows the rain. Water will not destroy or hurt concrete. Just think of highway bridges and the supports they have? They are almost universally concrete. 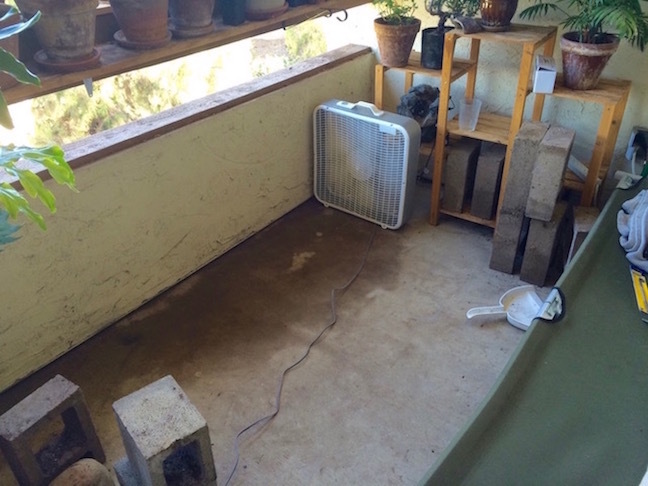 Now, the photo of your balcony shows a crack, and water will drain thru that crack to whatever is below. Construction design and build varies greatly. Some are waterproof, but most are only water RESISTANT. That means they just resist a small amount of water. So, don't worry about destroying your concrete balcony, because you will not, but your water may migrate thru that crack or other openings to whatever is below! I always enjoy reading your blog! All the best! Wish I thought of that! However, I do not believe that I will mention your thinking to Robby the LandLord. I'm going to dry out the damp concrete, and then cease watering flowers or doing potting out there. Thank you sooooo much for your compliment about my Blog! Isn't that an electrical cord and not a crack? For the same reason I look at the dogs at the SPCA even though I can't have one. They are free! Yes, that's it. Dreams and nostalgia are free -- love that. Dream on! Tiny hard-sided folding trailers could easily be pulled by your car for a weekend get-away! Come on, you can do it. Still got the old '83 class A Winnie George. But have admit I only use it about 8 weekends a year. It gets harder! Yes. "Harder", that is the operative word. Hi, George. I got an unhappy surprise this afternoon. I thought I could always go to the archives & find your blog posts all the way back to 2004. I wanted to find some of those pictures in my head from Santa Rosalia. So disappointed to find out that I can't. I went to the first titled one in 2009. Discovered that the "yesterday" would take me back.a day. I got back several days, then, boom. I am back to today. After going down that road 3 times, I gave it up. Sad!!! Is there something I don't know about this? I really wanted the picture of your garden then. Anyway. You stay upbeat. Most important of all. I myself just used my Archive Calendar links to go back to my first blog post in May, 2003. What browser are you using? Try using another browser.